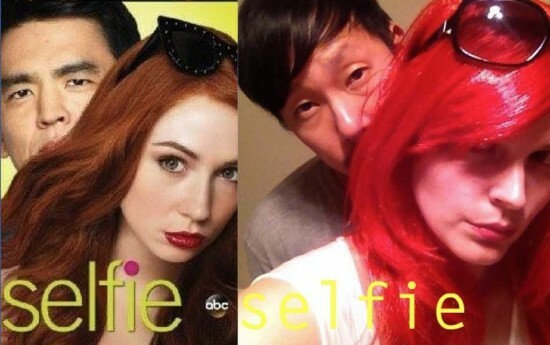 Last time out, I wrote that if ratings for the ABC sitcom starring Karen Gillan and John Cho didn’t improve, the Nov. 11 episode of “Selfie” might be our last opportunity to see another one. I was right (well, kinda. Read on). Although the first episode got 5.3 million viewers and a 1.6 rating in the 18-49 age range, it soon fell against increasing competition (“The Flash” on the CW and “MasterChef Junior” on Fox). Both of its election night episodes brought a measly .9 rating (rotten night; some stations pre-empted them for election results coverage) and it remained at that number on Nov. 11. On Nov. 7, three days after the double-dose episodes, ABC announced it wasn’t ordering any more episodes of the show. That prompted Erika Lawson from Kentucky to initiate a change.org petition asking ABC to give it a second season. Within four days, she had collected over 10,000 signatures (it’s now past 27,000). The afternoon before the Nov. 11 episode aired, I sent an email to ABC President Paul Lee and diversity head Tim McNeal asking what could be done to save the show. 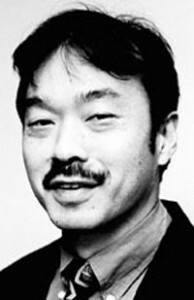 I included links to an Entertainment Weekly article (the critic who graded the pilot a C admitted she’s now a fan) and Salon.com article (which pointed out the importance of an Asian American male romantic lead). McNeal called, and I bounced several scenarios of what could be done. He said Lee had been a big champion of the sitcom, but the numbers just weren’t there. When companies place ads on a program, the network guarantees a target number. If the audience falls below that mark, the network has to refund money to those sponsors. Meaning they literally lose money week by week. So the best bet was to call advertisers asking them to be patient and give the series a chance to grow. On Nov. 13, I communicated that to fans on Facebook and Twitter. People like the South Bay’s Heather Johnson committed to calling them. Jj Delacruz in New York already had a list of the show’s sponsors on his own website. But later that day ABC announced it was pulling the following week’s episode and would instead air a repeat of “Shark Tank.” The network had already planned on running various specials in its slot in December, so there wasn’t anywhere for it to be broadcast in the future. Heather Johnson and Jake Yu re-enact Karen Gillan and John Cho’s “Selfie” pose. A day later, Keli Lee, ABC’s senior VP of casting, called me from New York to tell me how much “Selfie” meant to them and how proud she was to have cast John Cho in it. She hoped he’d be willing to work with them on future shows. But there was now no show for any advertisers to place ads on, nor reason to ask them to be patient about audience growth. On Monday, Nov. l7, I emailed the two Lees and McNeal, pointing out that the series had trended on Twitter in the L.A. area (ranking as high as #5) and that the number of people following “Selfie” was almost five times those eyeing tweets about “Blackish,” which ABC had already picked up for a full season. There had been 50,000 tweets about the show in a month (and an additional 50,000 #DontCancelSelfie tweets that originated from Russia!). Fans were also expressing their grief from the U.K., Italy, China, Brazil, and France. Not bad for a sitcom that only aired seven episodes. I asked that ABC Studio shop it to another network or cable outlet, just as it took the failing “Cougar Town” to TBS, where it will flourish for three more seasons. I later realized “Selfie” was produced by Warner Brothers Television. So I tried to guide Twitter followers to call that studio. On Wednesday, Nov. 19, Emily Kapnek, creator of the show (she also created ABC’s “Suburgatory”), tweeted that the remaining six episodes of “Selfie” would air on hulu.com and abc.com thanks to Warner Brothers President Peter Roth. While many fans let out squeals of joy and seemed placated, MANAA still felt the studio should try to shop it elsewhere. After coming to a MANAA meeting on the 20th, Heather Johnson agreed to call Peter Roth’s office the following day and push our suggestion (I was going to be out of town that day). After Johnson explained what she was calling about, Roth’s secretary hung up on her! I tried the following Monday and she did the same! How rude! Was Roth sick of the Twitter movement? Johnson had sent an email talking about the groundswell of support to save the show to Roth’s office, which passed her contact number to “Selfie’s” publicist, who left a message for her. When I followed up with him on Monday, he told me they were “definitely aware” of the movement, but he couldn’t divulge if there was any plan to save the series. Later that day, Kapnek announced that new episodes of her show would begin airing on a weekly basis the following day (I watched the first offering and it continues to be funny and moving). Bottom line: If a studio is willing to air new episodes for free, it doesn’t look like it’s interested in shopping it elsewhere. In late January 2013, ABC announced it was going to pull all future episodes of “Don’t Trust the B—- in Apartment 23.” It wasn’t until April 18 that they revealed the remaining eight episodes would air on Hulu and ABC.com beginning in mid-May — almost four months after it left the air. Fans of “Selfie” are lucky in that they only had to wait two weeks to continue feeding their “Selfie” cravings on those same platforms. So, if nothing else, maybe the social media campaign helped make it happen a lot sooner. Then again, ABC’s announced it was also making unaired episodes of “Manhattan Love Story” (which followed “Selfie” and was cancelled before it) available beginning next week — and nobody mounted a campaign to see any more of that! Thanks to real troupers like Heather Johnson, who stayed up all night tweeting and re-tweeting trying to keep momentum alive, making “Save Selfie” T-shirts and caps and mailing 25 individually wrapped packages of lipstick (the kind Karen Gillan’s character wore) to Paul Lee to demonstrate loyalty to the show (she also tried sending him a salad — the kind John Cho’s character ate — but all she got was an irate security guard telling her he couldn’t and wouldn’t pass it on!). Early on, Johnson tweeted a picture of her (in red wig) and her boyfriend Jake Yu mimicking the logo of the show, which featured Gillan in front and Cho in the back. As a white woman with an Asian American boyfriend, she felt a vested interest in seeing a show like this succeed because she knew how rare it was to see a confident Asian American male in a romantic sitcom. All in all, it was a pleasant surprise to see such a fervent fan following unwilling to let their favorite series die. To see so many non-Asian Americans involved was encouraging and reinvigorating. 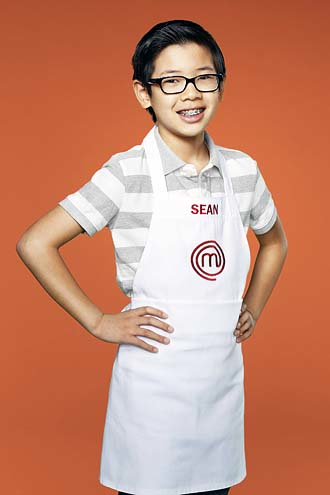 Channel Surfing Department: The final, shortened season of “The Mentalist” (just 13 episodes) featuring Tim Kang begins this Sunday on CBS at a strange timeslot of 9:30 p.m.
Sean Lee, a 12-year-old Asian American from Santa Ana, is one of the final four contestants on Fox’s “MasterChef Junior,” which airs Tuesday nights at 8. He’s expected to place in the top two. 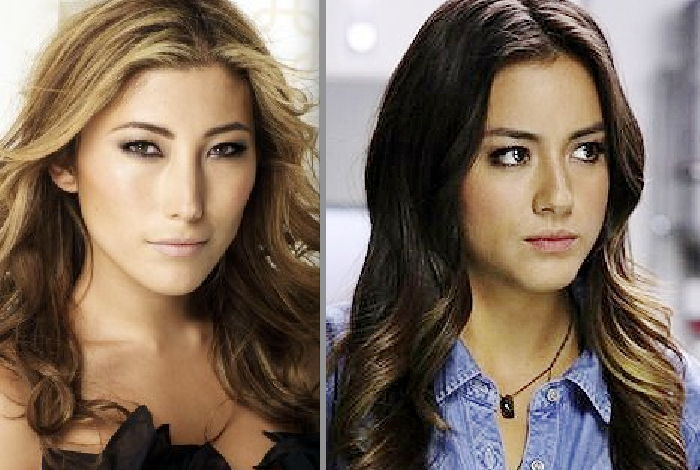 In last week’s episode of “Marvel’s Agents of S.H.I.E.L.D.” on ABC, we finally saw the mother of Skye (Chloe Bennet; real name Chloe Wang). In 1989, an evil Nazi scientist realized that an Asian woman (Dichen Lachman, previously a regular on ABC’s “Last Resort”) in a Chinese village hadn’t aged since he saw her during World War II. He had his scientists literally tear her body apart to determine what allowed her to remain youthful, he put her fluids in his body, and the old man reverted back to looking as he did back in the Hitler days. He then coldly told his henchmen to discard of her body. A devastated Kyle McLachlan (known only as “The Doctor”) found her dead outside, cried, and vowed revenge. In present day, he appears to team up with the scientist against S.H.I.E.L.D., but he’s really out for blood and wants to finally see his daughter again. So it’s nice that a Hapa actress who could pass for white is now officially a Hapa character. Good move, Marvel and ABC. The fall season finale airs next Tuesday. After that, it won’t be back until March. In CBS’ “Stalker,” we learned that the name of Maggie Q’s character, Beth Davis, is actually a made-up identity; her real name is Michelle Webber. Apparently years ago a stalker set fire to her home and she lost family members. She secretly checks in with authorities to make sure her attacker is still in custody. But she has another stalker who’s broken into her apartment and stole and mailed back to her a stuffed teddy bear, just to let her know that he’s invaded her personal space. The drama airs Wednesday nights at 10 p.m.